Italy’s most celebrated public intellectual gathers five essays that focus (more or less) on how lunatic misunderstandings concerning the perfect language have led to new discoveries (sort of). Eco (The Name of the Rose, 1983, etc. ; Semiotics/Univ. of Bologna) remains Italy’s most successful and prolific writer. He is a novelist, cultural commentator, essayist, literary critic, and scholar of language. 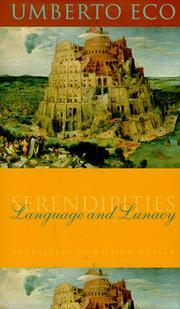 The present volume of essays is spun off his work on the historical search for the “perfect language,— i.e., the language that God gave Adam, the one that was lost in the catastrophe at the Tower of Babel. But the conceit with which he rather unsuccessfully attempts to unify the book is this: the search in the cases he explores always involves either outright errors or otherwise fictional inventions that have somehow led to positive discovery. After all, Columbus accidentally discovered the New World owing to miscalculations about the size of the earth. Eco sees similar situations in the history of language. For example, a 16th-century Jesuit, Father Athanasius Kircher, fancifully and elaborately interpreted ancient Egyptian hieroglyphics as the lost language of the Garden of Eden. “Kircher was wildly wrong. Still, notwithstanding his eventual failure, he is the father of Egyptology.” This and similar disappointingly general findings do not satisfyingly deliver on the promise that the errors serendipitously produce truth. But all is not lost. The meandering erudition of Eco’s book is interesting enough in its own right. He speculates, for example, that Dante believed his own Italian vernacular, as distinct from official Latin, was in fact an echo of Adam’s perfect language. And, he examines philosophical attempts by Leibniz and others to recreate a perfect language and Joseph de Maistre’s combination of linguistic mysticism and reactionary politics. The genial Eco may have had the lay reader in mind when he wrote these essays (which were originally lectures), but his book of linguistic arcana is also of avowedly esoteric interest.